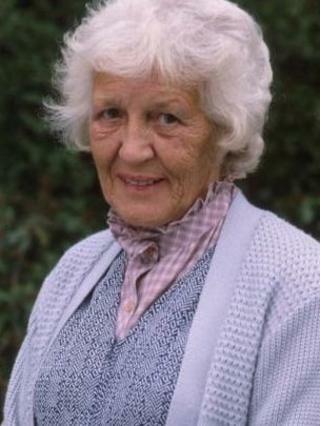 Actress Edna Dore, who was best known for her role as battleaxe Mo Butcher in BBC soap EastEnders, has died aged 92. Her agent, Belinda Wright, told the BBC News website she died peacefully in her sleep on Friday. The actress played Mike Reid's on-screen mother between 1988 and 1990 - a role which saw her character diagnosed with Alzheimer's disease. As well as her soap opera stint, she also starred in Mike Leigh's High Hopes and Gary Oldman's Nil By Mouth. Ms Wright paid tribute to Dore saying: "I'd known her for more than 30 years and she was a wonderful actress and great fun." Born Edna Gorring and raised in Bromley, Kent, she began her career as a chorus girl with the Entertainments National Service Association during World War Two before spending almost 20 years in repertory theatre, as well as another decade at the National Theatre. In the 1960s and '70s she also appeared in the West End, playing Mrs Sowerberry in Oliver! at the Albery Theatre (now the Noel Coward Theatre) and Mrs Crabtree in Billy, starring Michael Crawford. She also appeared in BBC bingo comedy Eyes Down, which ran for two series in 2003 and 2004. Paul O'Grady, who starred opposite Dore in the sitcom, paid tribute to the actress on his BBC Radio 2 show on Sunday, describing her as "a remarkable lady". "I've never had so many laughs, she was just a bundle of fun," he said. "We got sent home from rehearsals one day for laughing. I won't tell you why but Edna said: 'In my 70 years in the business, I've never been sent out of rehearsals'. "She had a remarkable career. She might be gone but she's not forgotten by me. I had a ball with Edna, what a laugh she was." Dore's appearance in EastEnders coincided with her performance in Leigh's 1988 film High Hopes, for which she was named best supporting actor at the European Film Awards. At the ceremony in Paris, the actress, whose name was spelt with an acute accent over the letter "e", was called to the stage as "Edna Door". As she left clutching her prize she muttered: "You'd think that at least in Paris they'd pronounce my bloody name right." She worked with Leigh twice again, taking small roles in his 2002 film All or Nothing and 2010's Another Year. As well as Oldman's Nil By Mouth, Dore's other film appearances included Les Miserables (1998), Tube Tales (1999), Goodbye Charlie Bright (2001) and Ray Winstone drama 44 Inch Chest (2009). Writing in The Guardian, the director said the actress "swore like a trooper, smoked like a chimney... and didn't suffer fools". "She initially approached the rehearsals for High Hopes with a healthy scepticism, but once she trusted having no script, improvising in character, and me, she entered into the spirit of the thing with unbounded enthusiasm, even playing some scenes with her teeth out. "She was very funny - her filthy jokes were legendary. We will all miss her no-nonsense wit, her generosity, and, above all, her uniquely truthful acting." The actress married fellow actor Alexander Dore in 1946. He died in 2002. She is survived by their son, Michael.